Looks Good from the Back: Marianne: Opinions needed. Looks great! I love my Mackage Milla jacket; totally worth the investment. Mackage is known for it's fitted silhoutte, says the girl who has too many jackets and coats from the line then is probably healthy. Yeah, the consensus seems to be that if you can zip it, it fits. I wish I had an inch more of length in the arms, but I have really long arms. Leather jackets get bigger with wear, like boots and other leather products. I think it's okay, especially since you won't wear it zipped! It looks great on you, by the way! And your makeup looks stunning in the pictures, btw. Really lovely combination--you look fresh, well-rested and rosy-cheeked! I really like the way it looks and think that the fitted look is actually better than the loose look (I don't care for the fit on the second model). The only issue I have with fitted jackets is that they sometimes pull across the back, restricting my arm mobility and cutting off circulation in my armpits (if that makes any sense), so unless the jacket is doing that or is otherwise uncomfortable, I think you found a winner! I think the fit on the jacket works well. Also, I LOVE that blouse on you (and immediately went to Old Navy and ordered it for me!). I think most importantly is how you feel in it? Like a rockstar or like you are in a jacket you think is too small? Are you comfortable? P.S. You look great and happy. 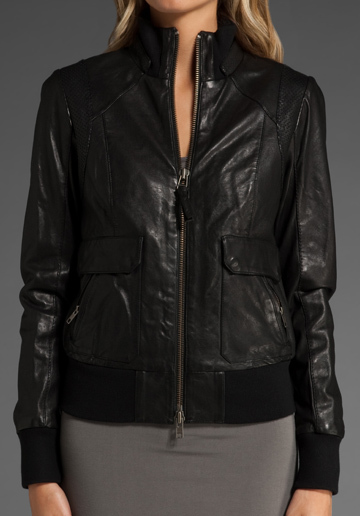 I think it looks good especially open -- it can look kind of fussy to zip up a leather jacket too far. I wear most of mine open. I think the last time I zipped some of them was the first time I tried it on! As long as you can move your arms easily, I think it's fine. You're wearing a flowy top that really shouldn't be confined in a slim fitted zipped up jacket anyhow. If you're gonna keep it open most of the time, I say keep it, and if you plan on zipping it, wear a tighter top underneath. I never wear leather jackets zipped so I think that you can zip it but likely won't makes it a great find! I also like how you styled it with the blousey top. You guys are the best. Aw. It's comfortable across the shoulders, so with your approval I am feeling much better about my investment! I just love your blog and am sad on the days neither of you posts. I love how you combine high quality, expensive pieces with bargain pieces. I've started buying Target dresses because of you. When I saw this Old Navy blouse I had to get it. I wore it for the first time ago and so many compliments. It was surprising how many people noticed it and said something about it - even my husband! Keep up the blogging, you guys are great!